The ninth of the ninth lunar month. Nowadays often celebrated on the 9th of october. Now mostly held in October, celebrating the end of the harvest time.
. WKD : Chrysanthemum (kiku) .
. asacha nomu soo shizuka nari kiku no hana .
. hatsu shimo ya kiku hie somuru koshi no wata . Written on the 4th day of the 9th lunar month 元禄2年9月4日 〔1689.10.16〕 during his trip Oku no Hosomichi. He stayed at the samurai home of Asai Saryuu 浅井左柳 Asai Saryu in Ogaki 大垣 and this is his hokku at the haikai meeting. Basho had to leave Asai again on the 6th of the ninth lunar month on his way to Ise. Not much is known about him. 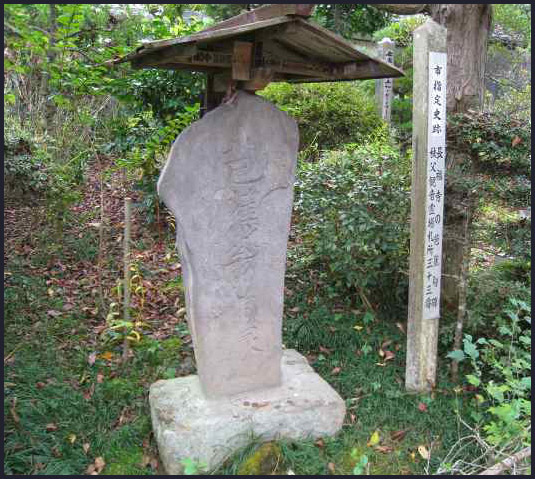 His name was Genbei 源兵衛.
. Basho at Temple Menshooji 妙法山明照寺 . Chrysanthemums are a symbol of long life and this old woman was still doing her chores at the old farmhouse. She is to be appraised and celebrated just as the chrysanthemum flowers. 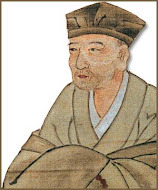 Written in October in 1692 元禄4年, Basho age 48.
. izayoi no izure ka kesa ni nokoru kiku . izayoi is a word usually used for the moon on then next best day, but here Basho uses it for the next best day to view chrysanthemums. The best day for the chrysanthemums is the ninth day (of the ninth lunar month).
. kagemachi ya kiku no ka no suru toofugushi . The following verse on chrysanthemums, for example, literally places the heavily loaded conventional image in a quotidian “run-of-the-mill” scene. 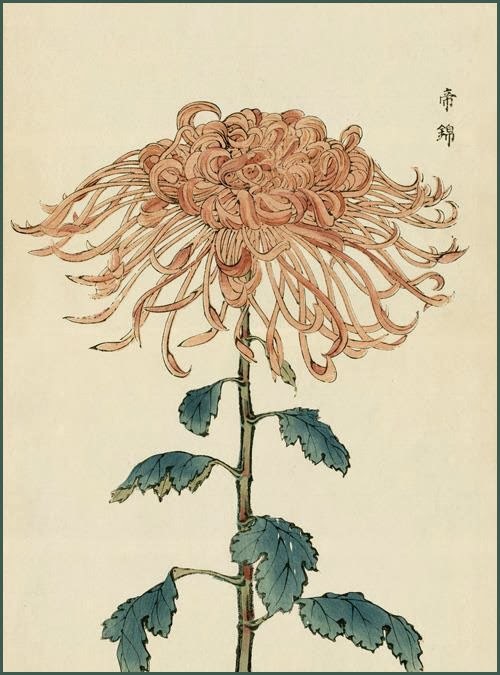 The hokku above testifies to Bashô’s conviction and sets chrysanthemums outside the conventional periphery of associations: instead of suggesting elegance or the life of a recluse, as seen in Bashô’s earlier haibun on his plantain hut that imitates Tao Qian’s poetry, here chrysanthemums are accompanied by a “hand mill,” an extremely common item in an ordinary person’s life in Bashô’s time. To achieve novelty and naturalness through unconventional combinations was an important technique Bashô used in his last years; by so doing he shook off the heavy conceptual meanings the old traditions had loaded upon poetic images and brought them back to a natural lightness.
. The hand mill of the Kappa - folktale . This was a lighthearted (karumi) hokku of a linked verse meeting with his disciple Shida Yaba 志太野坡. Written in 1693 元禄6年, Basho age 50. Basho was sitting outside in the sunshine of his garden, pounding rice with a mortar and mallet (or a handmill) to prepare mochi ricecakes. Some of the flour fell on the chrysanthemums and looked almost like snow. This is temple nr. 33 at the Chichibu Kannon Pilgrimage. The name of the temple means "Chrysanthemum Water". kangiku, lit. "chrysanthemum in the cold"
. fuyugiku 冬菊 winter chrysanthemum .
. Basho and the chausu, cha usu 茶臼 tea-grinding mill * .
. WKD : kazariusu 飾臼 New Year decoration for the mortar .
. ishiusu zuka 石臼塚 mound with old used stone mortars .
. for Nichiren, Saint Nichiren 日蓮 .
. kiku ni dete Nara to Naniwa wa yoi zukiyo . Naniwa is the old name of Osaka.
. kiku no ka ya Nara ni wa furuki hotoketachi .
. kiku no ka ya niwa ni kiretaru kutsu no soko .
. propagule 零余子 (むかご) mukago, nukago .
. kotobako ya furumono dana no sedo no kiku .
. sakazuki no shita yuku kiku ya kutsuki bon .
. sakazuki ya yamaji no kiku to kore o hosu .
. shiragiku no me ni tatete miru chiri mo nashi . Written when Basho was around 40 years. - 寿多ければ恥多し / 命長ければ恥多し "Long life has long misery." "If life is long there is a lot to be ashamed of." "The longer you live, the more shame you suffer." 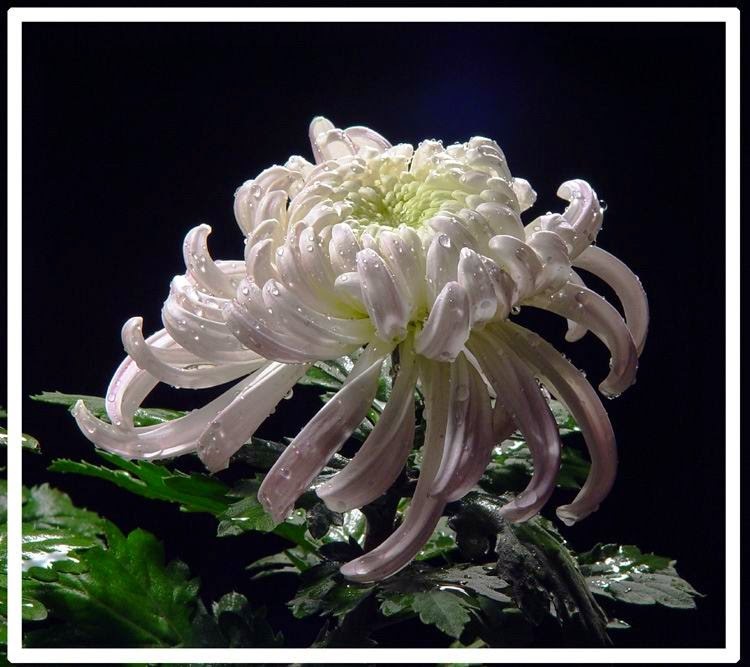 The white chrysanthemum is compared to a long life. The long white petals are compared to the white hair (long life). (BTW, this is considered of one of Basho's "tsumaranai" trivial poems. The kireji YO is used four times, but not to CUT, but to emphasize the astonishment, surprise, exclamation. The word YO is part of the normal Japanese language, not just a kireji for hokku/haiku. The actual CUT in the meaning is after the word HAJI - shame. Basho did not use the cut marker YA, which is only used in poetry, but not in normal language.
. - kire 切れ　and kireji 切字　- cut and cut markers . shame - Oh this long hair !
. Yamanaka ya kiku o taoranu yu no nioi .
. WKD : Chrysanthemum (kiku 菊) .